A Tonk's Tail... err, Tale...: Monday Throw Down! Nothing like a good smackdown to start the week! LOL smackdown time. Have a marvellous Monday. You better watch it, Maxie!!! Didin't your mother tell you to not mess with the girlz??? 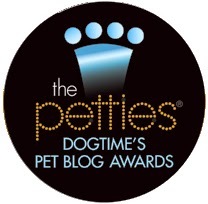 We've been nominating everyday and will be sure to add both your pawsome blog and your shelter picks in! Fight nice guys. he he wish I had someone to smack except M when I want to play. We yelled NOOOOOOO! Then we realized it's you. Well, you can't say you didn't listen. You did. But heard nothing. So, smackity smackity smack. MOL! MOL, I knew there was going to be trouble right from the start! 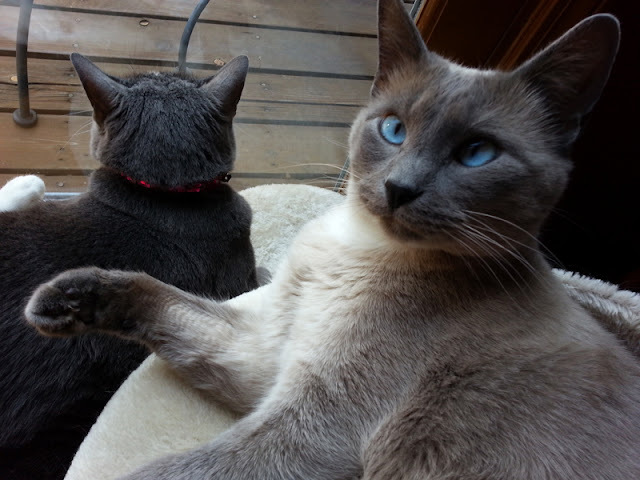 Maxwell: Uhm, did you say something Whisppy??? MOL! 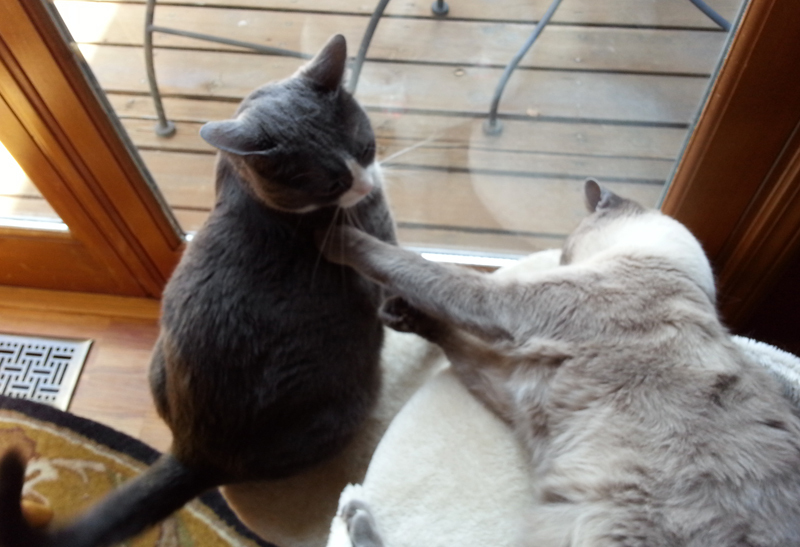 Momma sez Faraday's a bad influence because I'm hardly ever the one who instigates. Oh I say "when in doubt - SMACK!! "....well done! Maxwell you might be in trouble Allie's look there is shooting lasers. The Petties are good things that raise awareness too :) Good luck !! Any time is a good time for a little shove, just to see what it might lead to. Hope it wasn't too strenuous 'cause you two look mighty comfy. Purrs and hugs from the kitties at The Cat on My Head, Lily Olivia, Mauricio, Misty May, Giulietta, Fiona, Astrid, Lisbeth and Calista Josette. Yes, live dangerously! But watch your back! Mwahahahaha! Get him Allie! My money is on you! Smackdown!! Allie: don't you know it girlfriend! We nominated you ;-) You're all such a bunch of smarty-pants cats and Humans we was a-scaired if we didn't you might send a time warp or a photon torpedo or a wormhole or something and swallow us up!! Heh heh. But we have our secret Shakespearean Sonnet forcefield to counteract all that just in case you was thinking about it. Bwaaaa-ha-haaa! Oh noooooo, not the Dread Sonnet Ploy! Smacky-paw showdown! What a great way to start the week. MOL! Oh Allie, I know just how you feel. Brothers! Nothing like a nice Whack to wake some kitty out of a deep rest! Sounds like a worthy shelter.